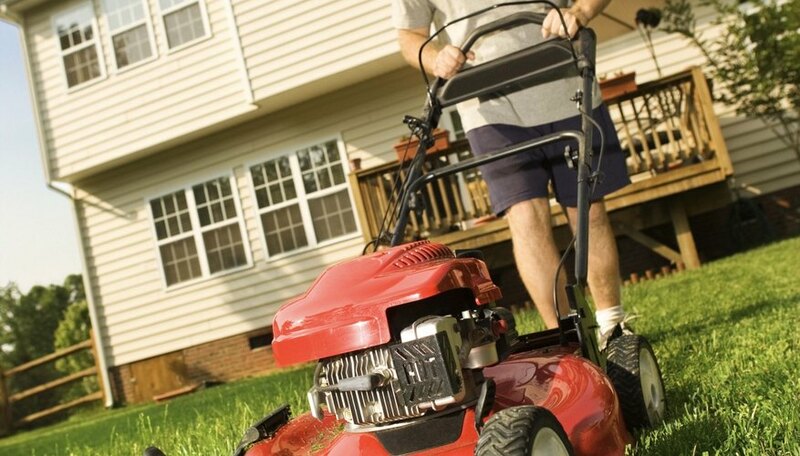 A lawnmower engine will idle around 1,200 to 2,000 rpm. This idling system will allow just enough fuel into the carburetor for the combustion process to continue. When the mower has trouble idling, or idles too low, the mower will shut off. Often this is caused by a decrease in air or fuel to the carburetor. A lawnmower uses its air filter to purify all incoming air. If the air isn't cleaned, dust and debris would be sucked into the engine, scouring the bore. However, when the air filter gets too dirty, the decrease in the air supply will cause the mower to have idling problems. Air filters on lawnmowers generally need cleaning every 10 to 15 hours of operation and replacement every season. The fuel filter performs the same function inside the fuel tank. If the fuel isn't filtered, foreign matter could destroy the carburetor. The mesh screens inside the filter, when they clog, will cause a drop in the gas supply. This will cause the mower’s idling function to suffer, and the mower may shut off. The fuel filter should be checked every 15 to 20 hours and cleaned if necessary. Like the air filter, it needs replacing every season. Lawnmower carburetors typically operate with an idle speed mixture screw. This screw opens and closes a small vent on the carburetor’s intake. When the vent opens, more gas comes in, and the idle speed increases. When the vent closes, less gas comes in, and the idle speed decreases. If the fuel and air system get too dirty, the carburetor’s screws will also not allow enough air and fuel into the carburetor. Let a professional adjust the carburetor at the beginning of the season. Carburetors on lawnmowers generally need cleaning and servicing only once every few years. However, if the operator left gas in the tank during a storage period, the dried gas may have damaged the fuel system and dirtied the carburetor. The sticky substance left by the gas will cause the idling system to be out of alignment. A dirty carburetor should be removed, disassembled and cleaned. A service professional should perform these duties.